Northwestern will transition from Blackboard to Canvas, a course management system with more flexibility and user options, the University officially announced Tuesday. The transition, which has an expected completion date of August 2015, will take place over the course of the 2014-15 academic year, after undergraduate and graduate classes participated in Canvas pilot programs over the past year. The official announcement was made after the Learning Management System Review Group, consisting of faculty and staff members, compiled four recommendations for the adoption of Canvas that were brought to the Educational Technology Advisory Committee. The group’s recommendations included beginning the transition immediately, conducting comprehensive training during summer 2014 on the new interface and forming a “steering group” to ensure a successful transition. 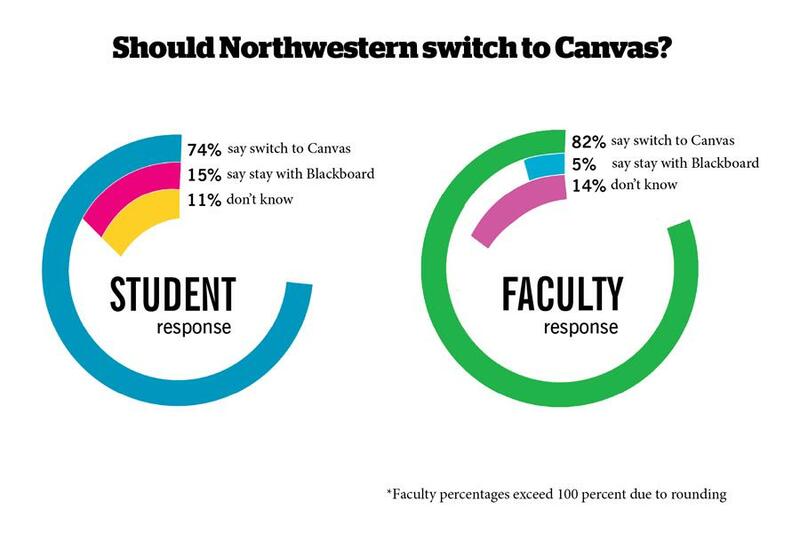 Survey results from students and faculty who engaged in Canvas pilot courses over the past year also showed overwhelming support, with more than 70 percent of students requesting the switch from Blackboard to Canvas. An even greater percentage of faculty supported the transition. Students also found the interface relatively simple to learn with nearly 80 percent of students reporting that learning Canvas took them about 30 minutes, noting an in-class demonstration and online tutorials helped to ease the transition, Taylor said. “That’s a pretty high vote of confidence for the students,” Taylor said. In the past, faculty have brought requests to NU Information Technology requesting a system with a greater number of options in order to better accommodate educational goals, Taylor said. “(Blackboard) wasn’t letting them innovate in terms of their teaching and learning activities as much as they thought they should be able to do with an educational platform,” Taylor said. Canvas is much more adaptable and has greater flexibility, a quality faculty appreciated in creating new course websites, he said. Taylor added Canvas had better mobile support and received updates much more frequently than Blackboard. Over the course of the next year, there will be organized workshops in order to help staff and faculty learn how to use the system and convert their classes from Blackboard to Canvas. To facilitate the transition, a Canvas transition team will be created to advise faculty and the University on the best ways to teach the system and how to most effectively convert classes from Blackboard to Canvas. This committee will be chaired by Medill Prof. Tom Collinger and Victoria Getis, manager of faculty support services. Other members of the committee will include faculty and IT staff, the Searle Center for Advancing Learning and Teaching and the NU Library. Kellogg Prof. Mitchell Petersen said he decided to take part in the Canvas pilot program over this past year after hearing about it last summer due to the interface’s additional features and its “intuitive and simple” design. Canvas allows instructors to spend more time thinking about the educational aspects and less time considering the technology aspects, he added. “The purpose of technology for us at the University is to stand in the background, so if we have a system that takes the faculty less time to figure out, less time to update, the students find it very intuitive. I think that helps immensely,” he said. Petersen said he has taught six classes in Canvas at this point and found the open source feature to be a major attribute. He said through the transition period, he had help from both NUIT and other faculty members who were also using the learning interface. Although he said he heard mainly positive feedback to report, as did most other faculty members he spoke with, he said as with any new system, there are always costs and benefits.